I still remember first order on my website, 5 years back. It was a normal day, the whole team worked intensely until day end. Other than customer service rep, I set a reminder on my mobile phone too. At exactly 11:48 pm. The magic happened. I was busy with friends & I left them to see who placed an order on my website. He was a 28 years old male, willing to send a gift to his friend in the USA. It was an awe-inspiring moment for me. Fast forward 5 years and here I am with my third venture online. Although a lot have changed since then, the customers, the usability, the e-commerce web design, and the responsiveness of the website, there are still few tips which made my previous ventures pretty successful than others in the market. In this blog, I would like to share my experience regarding my learnings. So, hang on guys, here is a roller coaster ride for you. The beauty of the internet is that there is a grand cosmos out there for you to test & try different things & go for what works & what not. Starting an e-commerce website is a daunting task. Running it is even harder. 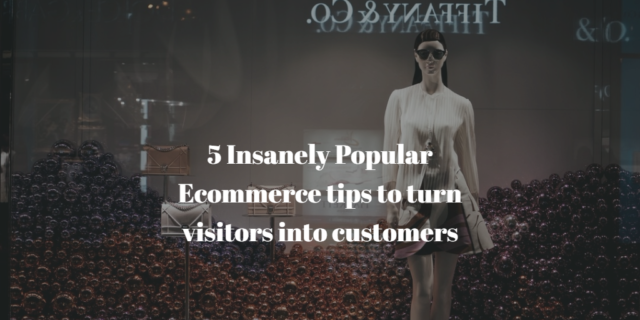 Presenting the insanely effortless e-commerce tips that can turn your visitors into customers in no time. If you suggest me 5 years prior that content marketing is king, I might consider referring you to a good doctor. But now, content marketing is not just some random text on your website. It is bread and butter of the whole company. People are hiring content strategist to manage the content going on their website. Yes, you heard me right, again this might not the case when I first started, but blogging, for now, is a necessity. Starting from Copy Blogger to Neil Patel you can see how these geniuses are selling everything on their website just by giving quality content on the website. From product descriptions to irresistible H1 tags, now you need to plan and think of everything that is going on your website. Furthermore, you need to plan everything from the eye of the customer. Is the content relevant to the customer? Is the content portraying the right image of your company? Make sure you answer these two questions before you put content on the website. In the past couple of years, content makers are focusing so much on treating every page as the landing page. This to me, will the key game changer in the years to come. From the headline to the text in the descriptions make sure everything is in the right place. Do not force the customers to think what to do next. If they want to browse certain category make sure your search gives them the right result. In a survey, it was concluded that 67% of the customers abandon the website just because of a poor search option. So, make sure to give your customers what are looking for. For every page, make it easy for Google to index it the right way. From the meta tags to the category descriptions, all should be in accordance to fulfill the need of the customer. Gone are the times when people use to trust a website just by looking at the content. Now is the time to put yourself out there in the video. People trust the video more than the content on of the website. I am not suggesting that abandon your content completely I am just saying apart from the content, providing video reviews for your product is the new proven way to boost your sales. Have you ever visited a website, found your favorite product but for some reason left the order undone because of the complex check-out process? If yes, congrats you are in the same boat as many others. Amazon realized this fact early that a complex checkout process force customers to leave out orders right in the middle. That is why one step checkout became an instant hit. The best way to embed a checkout process is to visit websites and test theirs. There are tons of plug-ins that are doing great. Check them out and use them in your store. When I was running my first venture, every day we got tons of queries regarding the safety of their credit cards. Until now, with a cyber crime so active, people still want a safe & secure payment option. Firstly, get the SSL certificate on your website. This acts as a security layer on your website. And show this to your customer. Second, use payment methods that are industry popular, like PayPal or 2Checkout. These are pretty famous and secure when it comes to taking payments from customers. On the concluding end, I would like to suggest that starting an e-commerce store is easy but running it, is hard. So, unless you are not passionate about selling products online do not go for it. But, if you are willing to sell products online then go for these tips and outsmart your competition.